Don’t have time for a walking tour but still want to get out and see the sites of South Beach? There is no better way than on a swift and sleek Segway. Choose from either a 1- or 2-hour rental, then proceed at any pace. See Miami’s sun-splashed skyline and explore the Art Deco District, the beach walk and all the attractions of beautiful South Beach, one of the most popular hot spots in the world. Instructions and training, plus a map of South Beach included. Cover more area than you would on foot! C'è molto terreno da coprire nel quartiere di Miami di South Beach. 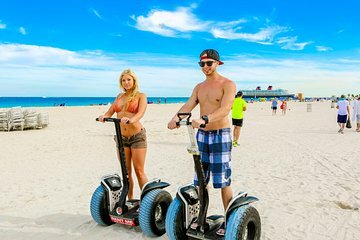 Piuttosto che essere confinati ai parametri di un gruppo di tour, esplorare a qualsiasi ritmo o direzione desiderato con un noleggio Segway di 1 o 2 ore a partire da Miami Beach. Dopo alcune istruzioni di base, se necessario, è il momento di colpire la strada aperta. Crociera lungo la vivace Ocean Drive, la principale arteria stradale di South Beach. Scendi alla Villa Casa Casuarina, alias la Versace Mansion, il famoso quartiere Art Deco e il Lincoln Road Mall, fino al bordo della bellissima Biscayne Bay. Lungo la strada, goditi soste per gli ops opuscoli sullo skyline di Miami e altri luoghi famosi in questa parte popolare di Miami. Se c'è tempo, scivola lungo il Miami Riverwalk, estendendosi lungo il lato nord del fiume Miami e Biscayne Bay attraverso il Bayfront Park. È qui che l'Oceano Atlantico, il fiume Miami e la baia di Biscayne si fondono insieme in un bellissimo corpo di acqua cristallina. Ammira i lussuosi condomini, gli yacht da milioni di dollari e le gigantesche navi da crociera. L'avventura di Miami Segway si conclude al suo punto di partenza a Miami Beach. A brilliant way to get around Miami and to learn from the guide about the history and buildings. Rather warm in August though so take a bottle of water or two and plenty of sunscreen!! Gordon was a good guided and he guided us well. I have one suggestion, please match the speed of the customers. My wife was very slow and could not catch up with both of us and i would prefer the guide to be match the pace of customers if they are unable to increase the speed. She fell down and hurt her backbone very badly and we both were ahead of her and both of us didnt notice. It wasnt his fault but as a precautionary measure it would be better if guide matches our pace and be with us. Additionally i would suggest them to provide helmets, We both were not given helmets. If by chance our head hits somewhere it is risky. I've been on 7 segway tours, including this one years ago. Now that the city won't allow the segway on the boardwalk, we were just in traffic the whole hour. It wasn't fun and felt dangerous at times. If you've never been on a segway it is nice to ride around on one, but this tour needs a sidewalk or safe pedestrian area. I took my daughter and regretted it. The company was nice and I loved our guide, Gordon, but skip this tour. A walking tour would be much safer. The seaways were really fun and easy to use after about 5 mins of practice. We did the 2 hour hire, and this included a guy who took us out, this would have been good for about 30 mins to get used to the streets, but he just looped around the same roads for a while before I asked him if we could go back down Ocean drive and he said no which was a bit annoying as we didn't stop to take any photos. He then took us over the bridge which on the waiver said not to do, which was cool, although felt pretty dangerous. All in all, we'd do it again, but I'd do the tour rather than just drive around with some guy which is why it only got 4s! Really great afternoon with Ricky. It's very relaxed as in don't bother with pads and stuff but I prefer it that way. I've done 3 Segway sessions and this one was by far the best. 2 hours of sight seeing. We would only have seen a fraction of Miami without the Segway. So easy to master. Our experience was ok. We had our training session down an alleyway that smelt of strong urine, which was not pleasant. We then went out onto the main roads of south beach, which was a little unnerving. Alan, the member of staff who took us out was really good and very patient, however my partner did come off of the Segway on a main road and not only badly damaged his ankle, but nearly got run over by cars traveling at 40mph. I would only recommend Segway riding if you stick to the boardwalks. If not make sure at you wear a helmet and pads. It was an awesome experience for grandparents and our granddaughter! The pre-instruction was terrific, and we felt safe when we took off. Seeing South Beach by Segway was so much fun! And the price was fantastic! Thank you Viatar! 1. Durch Hinterlegen der hohen Kaution von $ 800,- (für 4 Segways) wurde unsere Kreditkarte gesperrt, da hier das Sicherungssystem von VISA and quot;zuschlug and quot;. Das war besonders ärgerlich, da es gerade der zweite Tag unseres Urlaubs war. 2. Mitten auf dem Weg blieb das Segway meines Sohnes stehen. Zwar kam bald eine Mitarbeiterin mit einem Ersatz-Segway, jedoch ging uns diese halbe Stunde von unserer Zwei Stunden-Tour ab. Fazit: ich würde jederzeit wieder mit einem Segway durch Miami fahren, allerdings nur über einen großen Anbieter und auch nur mit Führung. The entire experience was awesome. SBSR was very helpful and courteous. We had a great time and would do it again.